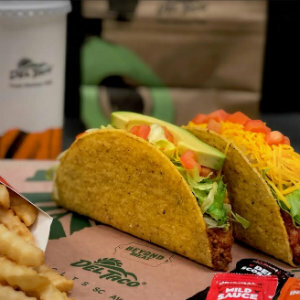 Del Taco, the first Mexican fast food chain to offer Beyond Meat’s plant-based protein option, will be testing Beyond Tacos starting Thursday, Dec. 13---made with Del Taco’s seasoned Beyond Meat recipe – at 16 locations in San Diego, and five in Los Angeles, Orange, Riverside, and San Bernardino counties. In Orange County, the first location to offer Beyond Meat options is at 23781 El Toro Road in Lake Forest. Guests in the test cities can now try one of the brand’s new Beyond Tacos which offer the same amount of protein and flavor as seasoned beef but are made with 100 percent plant-based protein. Beyond Meat is also being offered as a substitute for any protein in existing Del Taco menu items, such as burritos, nachos, and fries. Beyond Avocado Taco (vegan): Seasoned Beyond Meat plant-based crumbles, hand-sliced avocado, crisp lettuce and fresh diced tomatoes in a crunchy shell. Beyond Taco (vegetarian): Seasoned Beyond Meat plant-based crumbles, hand-grated cheddar cheese, crisp lettuce and fresh diced tomatoes in a crunchy shell. To learn more about Del Taco’s Beyond Meat test, and to find a list of participating locations, please visit www.deltaco.com/beyond.